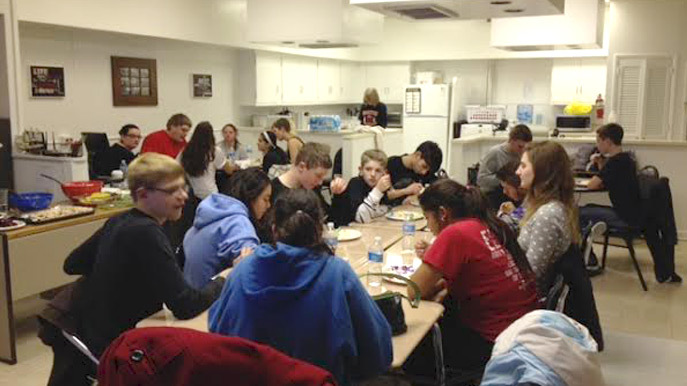 Students gather to socialize in Boonton’s Teen Advocacy Group (TAG) Program. Young people with disabilities often struggle to find an appropriate social group, either because their needs are too significant or the group is too advanced to meet these needs. The Teen Advocacy Group (T.A.G.) program provides a social group that is fun, while using innovative teaching techniques to enhance social and community-based skills. T.A.G. meetings take place twice a month on Friday evenings when school is in session. The group includes students with Down Syndrome, autism and multiple disabilities, among others, and members come from both in-district and out-of-district educational programs. General education high school students, who are recommended by teachers, receive special training to serve as mentors. Students get to socialize with their peers and participate in activities similar to what “typical teenagers” do on a Friday night, but each session is also designed with a specific goal in mind. A meeting might include a team-building activity, a dinner and scheduled activities in the community, such as bowling or miniature golf. T.A.G. members develop social skills along the way: They must telephone to RSVP, then during mealtime, they learn acceptable behavior and socialization skills. T.A.G. members sometimes help prepare the meals, and they also participate in service projects for local groups, such as nursing homes. The program began as a collaborative effort between the Boonton Special Services staff and the Boonton Exceptional Children’s Outreach Network (BECON), which includes district and community members. The original funding came from a grant from the Boonton Recreational Department. The initial sessions in spring 2009 were so successful, the Boonton Board of Education voted to fund the program for the following school year, and has done so ever since.